Rather than purchasing drinks at events, we prefer to take our own snacks and water bottles if possible. Because my nieces and nephews stop by often, I keep a collection of water bottles at home that I fill up with water for refreshment. I've been through my fair share of water bottles that leak or have lids that pop off easily, so I'm always happy when I find ones that are leak-proof and have secure lids. Cool designs don't hurt either. 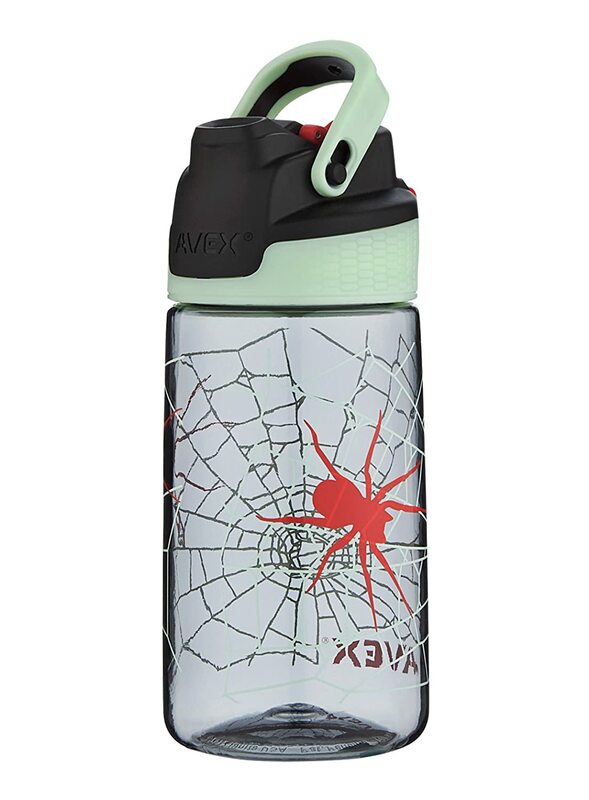 AVEX, a company known for its water bottles and thermal mugs, offered me the opportunity to review a Freeride AUTOSEAL Kids Water Bottle. With two designs available, I received the charcoal one with the spider pattern. This particular design of water bottle features a patented AUTOSEAL lid with press-to-drink button that automatically seals between sips to eliminate spills and leaks. Yay for that! Now I don't have to worry about young'uns making big messes. 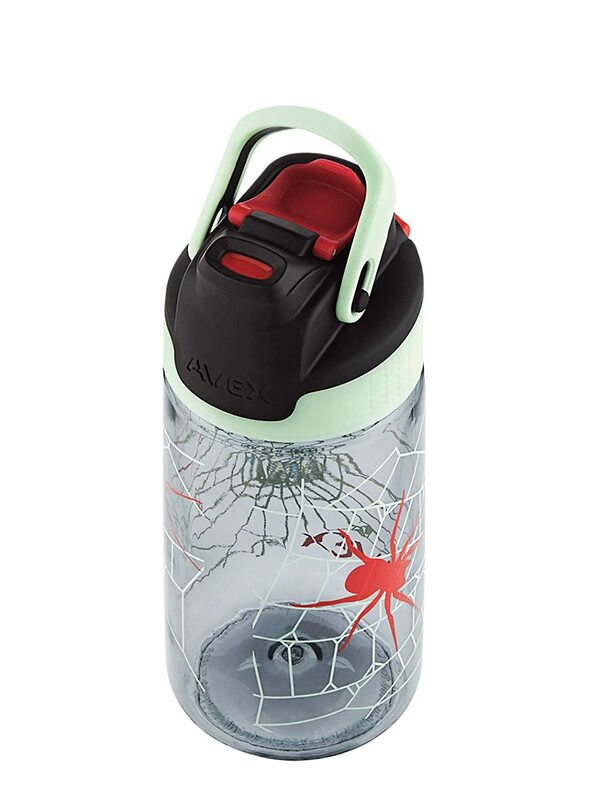 The BPA-free plastic water bottle has a spout shield to protect against dirt and an ergonomic clip-on handle that attaches to backpacks and other gear. I've had to help the younger ones with clipping the handle to their bag because it does take a bit of adult strength. Although I don't own one myself, the water bottle is made to be top-rack dishwasher-safe. The water bottle is composed of two pieces, the bottle and the lid. What the kids really like about this water bottle is the glow-in-the-dark lid and graphics. The light green colors on the bottle are what glow. The Freeride AUTOSEAL Kids Water Bottle does a nifty job and the graphics are quite neat. Do you tend to purchase drinks when you're out and about, or take water bottles for the kids to drink out of? Nice water bottles! I always love to get good ones for the boys. We go through water bottles like crazy. I finally thought I found one I that was perfect, it was non breakable. My son broke it. ;) In the bottle's defense though, he dropped it on concrete and concrete doesn't give. Those are cute! I love the glow in the dark feature.